Blockchain has emerged as a disruptive technology in the areas of trading assets and sharing information. It has the capability to transform many industries, professions, and aspects of life. The focus of this IBM® Redbooks® publication is to help developers build blockchain solutions and use IBM Blockchain Platform to start, test, and move applications into production. This publication covers some blockchain for business use cases. 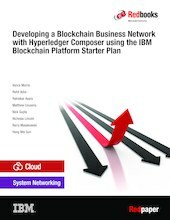 It also describes how to get started in defining, developing, and deploying a Hyperledger Composer business network to Hyperledger Fabric, both locally on a workstation and remotely on the IBM Blockchain Starter Plan.A fund clearing business network is used as an example scenario for blockchain and this source code is available for download, testing, and use. The Redpaper contains detailed information on how we put it together and more, so grab a copy of it via the download link on this page as well. This paper is part one of a series of papers and educational materials. Later materials will describe how to use IBM Blockchain Platform to test and scale your business network, to integrate more completely with a COBOL business application running in IBM CICS®, and to manage changes to your business network in a production environment.